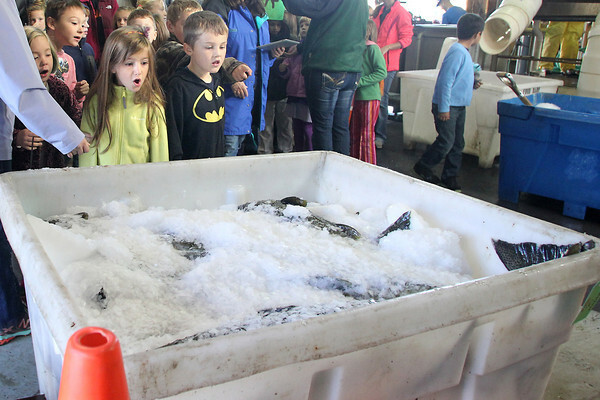 Zoey Butcher (cq), left, and Hunter Hull (cq) of Mill Creek Elementary School in Elk Rapids, watch ice-packed salmon get hauled away after being harvested Wednesday from the James P. Price Trap and Transfer Harvest Facility at the Boardman River weir in Traverse City. The Boardman is one of three rivers in the state salmon are harvested for commercial purposes, the others are Swan River on Lake Huron and Charlevoix's Medusa Creek. Salmon eggs are harvested from the Little Manistee and Platte Rivers. Heather Hettinger (cq), a fisheries wildlife biologist with the Michigan Department of Natural Resources, said this year's run of salmon is an average size, and that they will probably see fewer fish than last year. The largest chinook salmon harvested so far has weighed 30 pounds.